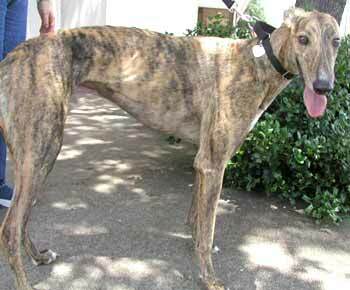 Fleet, aka CTW Amys Fleet, is a small brindle three-year-old male, born February 20, 2000. Fleet has been in a home for several years, but was given to GALT because of disharmony within the family. Fleet LOVES being a couch potato and really wants his forever home this time! His racing career was all in Florida from December 2001 to March 2002 - not long! Fleets grand sire was HBs Commander. He is half-brother to Classic, who shares the sire Evening Memory. Fleet is small animal and cat trainable.